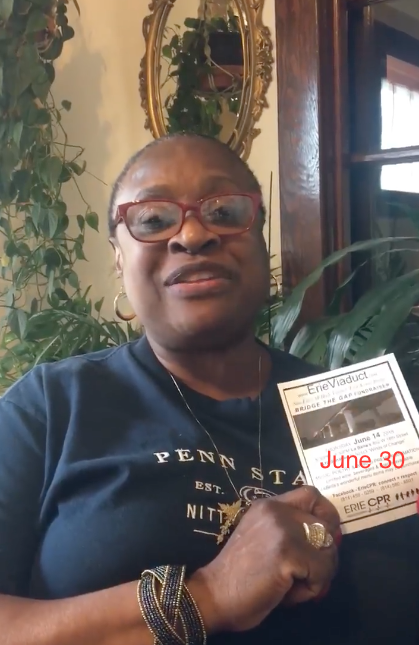 ErieCPR's Janice Cole Announces Viaduct Family Fundraiser June 30 — Why Save the Viaduct? To Keep Kids Safe. ErieCPR member Janice Cole announced today that a VIADUCT Family Fundraiser will be held on Saturday, June 30th from 11am to 1pm. The public is invited to the St. Nicholas Church Parking Lot at East 12th and East Ave. Everyone is invited to enjoy light refreshments, live music, make chalk drawings, blow bubbles, and play checkers. Pastor Luchetta Manus will read poems explaining “why the bridge should stay.” Musician Saint Stephen will liven the mood with adapted civil rights songs such as, “This Bridge is your bridge.” A printed, self-guided #ErieViaduct tour and orange wristband will be available for a donation. Funds collected will be deposited with the non-profit Erie Winds of Change (the 501c3 that is serving as fiscal agent for ErieCPR) to help cover the costs of gaining a Public Hearing and saving the Viaduct. ErieCPR member John Henderson wants to keep the Viaduct for all kids “until they figure out safety on the highway” and commented, “the Viaduct Bridge needs to stay because it connects the minority community and the poor to the rest of the city.” ErieCPR member Cynthia Muhammad, founder of the Erie Metropolitan Black Pages, will discuss the deliberate disinvestment of the Eastside through the process of redlining. Muhammad says, “the City didn’t maintain the bridge” and asked “why is that? Is it because it’s on the Eastside?” In addition to the Erie Chapter of the NAACP, the African-American Concerned Clergy of Erie have joined ErieCPR’s call for a demolition delay and Public Hearing. Older PostVDV#18 Barry walks his kids over the #ErieViaduct to get to school, etc.